Bart Shaw is an Associate at LKMco and combines experience of policy making at the heart of central government with hands-on experience as a teacher and middle leader in school. Bart joined the Department for Education and Skills as part of the Civil Service Fast Stream in 2006. There he developed, delivered and evaluated national policies including the £13 million subsidy pathfinder which helped disadvantaged students access after-school activities. He left in 2011 to work directly in schools. 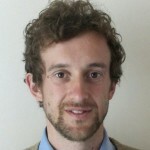 Bart holds an MA in Governance and Development from the University of Sussex and has been a trustee and advisor for the charity Development Nepal. 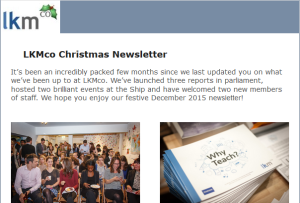 Tuck into a mince pie and have a read of our latest newsletter! We’ve had a very exciting last few months, with the publication of a number of major reports on subjects ranging from teacher recruitment, SEND reforms, how to develop the next generation of school leaders and the future of examining. Read about these reports and other goings on at LKMco here.